Boy Scouts is a youth program founded in Great Britain by Lord Robert S. S. Baden-Powell. Baden-Powell was given his first command in India in 1897, and with it the opportunity to use his own training ideas. He had his men train in small groups, made their training hard but enjoyable, and gave them increasing responsibilities. Baden-Powell wrote these ideas down in a small manual entitled Aids to Scouting, which he intended for military use only. Much to his astonishment, his Aids to Scouting was immensely popular with English boys - but it had been written to prepare men for war! What he wanted was a manual to prepare boys for peace. Baden-Powell gained fame as the defender of the besieged city of Mafeking in South Africa during the Boer War of the early 1900s. The senseless waste of life caused by the soldiers’ lack of survival skills appalled him and he begun to look for ways to prevent similar tragedies in the future. He also looked for a ways to make boys into better men. In 1907, Baden-Powell invited a group of boys to the first Boy Scout camp on Brownsea Island. The heart of Baden-Powell's idea was the Patrol Method, and one of the first things that he did was to divide the boys at Brownsea into four Patrols. Brownsea was a rousing success in both boys' and Baden-Powell's eyes. The secret of that success was the Patrol Method, of which Baden-Powell said, "Each patrol leader was given full responsibility for the behavior of his patrol at all times, in camp and in the field. Responsibility, discipline and competitive rivalry were thus at once established, and a good standard of development was ensured throughout the camp." The Patrol Method is still the heart and soul of Boy Scouting and is the core around which all the activities of the Troop revolve. B-P soon wrote “Scouting for Boys”, a book intended to pass on his ideas. It became an instant bestseller, and boys joined by the thousands. In 1909, William Boyce, an American visitor, was lost in the London fog. A young boy helped him to find his destination. When Boyce offered the boy a tip, the boy said, "No thank you, sir. I am a Scout. I won't take anything for helping." Intrigued, Boyce asked the boy what a Scout was. The boy told him about himself and his brother Scouts, and took Boyce to the British Scouting office. 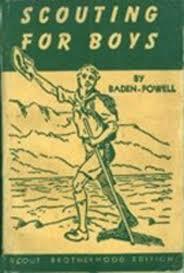 There, Boyce met Baden-Powell, and decided to bring Scouting to the United States. On February 8, 1910, Boyce and others founded the Boy Scouts of America. Since then, millions of boys have enjoyed and benefited from Scouting. Despite its founding by a military officer, Boy Scouts is not a military organization. It is a youth program with the objectives of developing character, citizenship and fitness. If you were in Cub Scouting, you will notice a major difference between that and Boy Scouting. In Cub Scouts, adults planned and ran the program. In Boy Scouts, the Scouts themselves plan and organize the troop. The role of the adult leaders is to train, guide, and assist them in doing so.